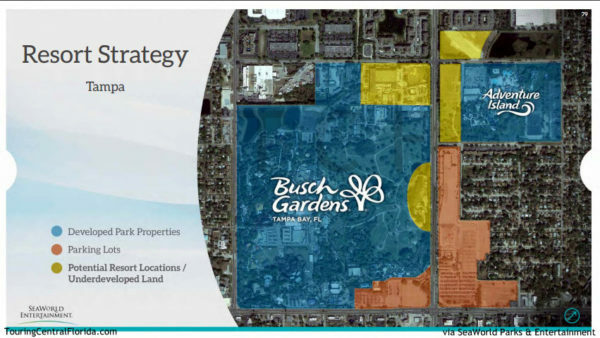 A permit recently filed by Busch Gardens Tampa Bay with the City of Tampa points to a new project at the park. The permit is for a Tree Consultation, and notes the purpose is for “future expansion” at the theme park. 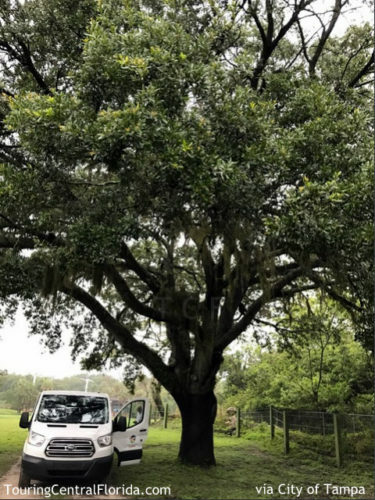 In Tampa, trees that reach a certain diameter are protected from removal without first going through a permitted process. In general, “grand trees” are those with a trunk diameter of 34 inches or larger (along with other factors), and “protected trees” are those with a diameter greater than five inches. For a grand tree to be removed, it must be considered hazardous, pose a risk of damage to a structure within the next year, or prevent reasonable use of the land, the use of which can not be reasonably reconfigured to allow the tree to remain. 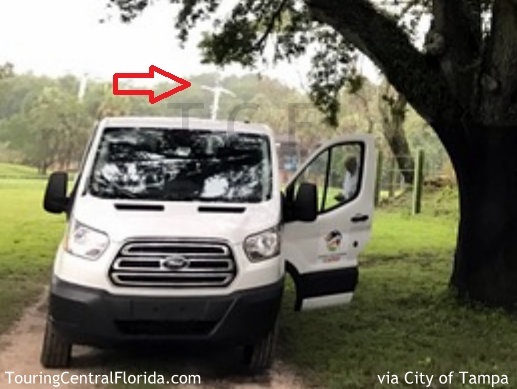 Several pictures taken by the contractor show the trees in question on the northern edge of the Serengeti Plain in the area of the train tunnel (note the Skyride support in the background of the first image below), and in behind the scenes areas nearby that are mostly used as animal holding pens. The report indicates a total of nine grand trees of which seven were visited and two more were viewed from a distance, and “lots of protected trees” in the area. One of the grand trees was noted as having some minor damage from kangaroos that were located in the pen with the tree. 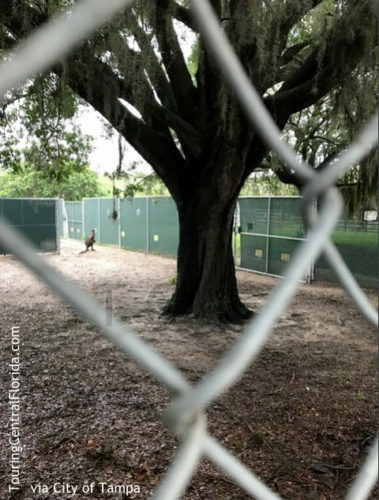 The area of the tree consultation could be the location of the long rumored resort hotel expansion at Busch Gardens Tampa. The location in question would be easily accessible via a road that already exists off Bougainvillea Avenue on the north side of the park, which is currently used for employee access to central areas of the park. A paved parking lot, currently used by employees, is right next to the location where the tree consultation took place. This lot could easily be converted to hotel guest parking (and reconfigured or expanded as necessary for that purpose). A November 2015 presentation to investors noted possible resort expansion plots at various SeaWorld parks properties. While the location of the recent tree consultation is actually within the area shaded as developed, and the possible resort plot in yellow is to the north, it’s certainly possible that plans have changed since the presentation was made over a year and a half ago. 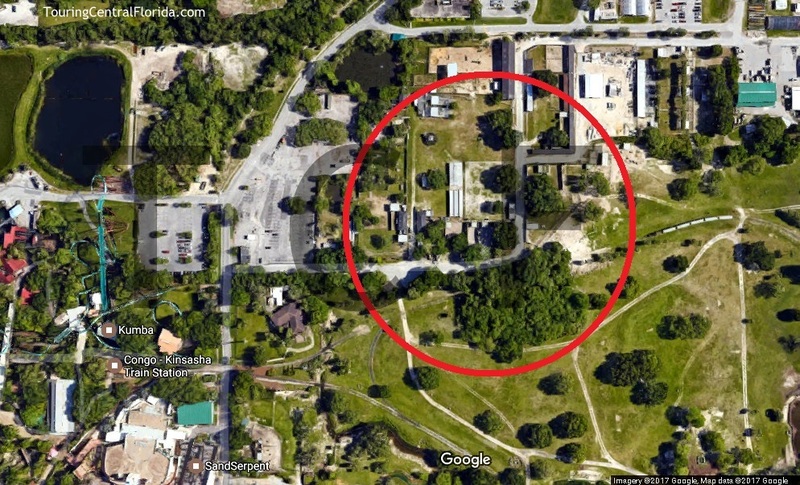 Another possibility could see the area being used for an attraction, such as a roller coaster. The entrance/station could be on another plot of land closer to current in-park pathways, with the area of the tree consultation being where the roller coaster or other attraction travels to. The unused former Rhino Rally plot is not far from this new location. Of course, the tree consultation could just be part of a study to decide if that plot is feasible for any number of projects, and there’s no guarantee anything will come to that area, or when it might if plans do progress. 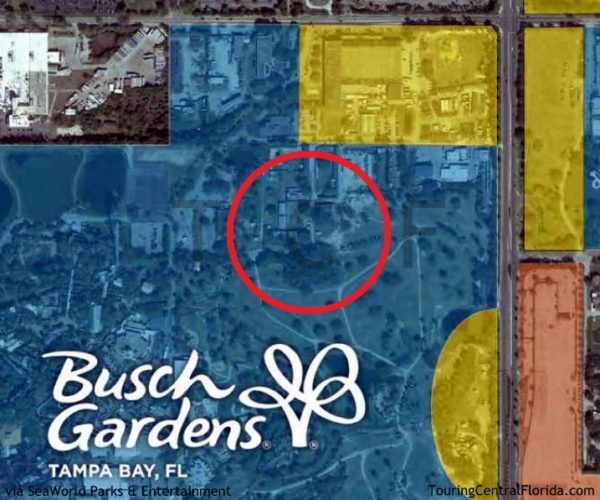 What do you think this possible expansion at Busch Gardens Tampa will be? Leave a comment below, or join in on the conversation with us on social media.